Prevent a real Pain in the... KNEE! Kneeling at work is a daily reality for tradespeople and something that when we start out doesn't get thought about a lot, if at all. When we're young stuff works as it is designed to. Yes, kneeling on a screw-head hurts a lot when you're 16, but generally kneeling isn't something that you have to think about - it doesn't bother you. That's great, but it might not always be like that. Without care, and good knee protection, you may be left with significant knee problems, sometimes chronic that lead to severe pain and discomfort that may even prevent you from working in your chosen trade, or continuing to do the leisure activities that you enjoy, like playing football with your mates or your children. The knee is an amazing joint, not only does its hinge-like design allow you to bend your leg, the joint also twists, rotates and straigtens and is designed to withstand a massive range of stress and forces. 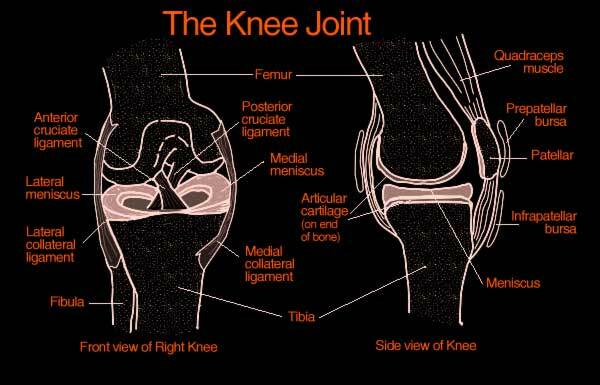 The knee joint is composed of four bones: the thigh bone (femur) and shin bone (tibia) are the larger of the four, and they meet head-to-head in the knee joint. The smaller shin bone (fibula) is positioned to the side of and just beneath the tibia, leaving the fourth bone, the knee cap (patella), which protects the knee joint from injury and trauma. These four bones are connected by muscles, ligaments, and tendons, and together these structures allow you to move as well as keep your knee joint stable, aligned, and healthy. One more critical structure is part of the picture; Cartilage. This gel-like, elastic tissue is a security and shock-absorber system rolled into one: it prevents the ends of the knee bones from banging and grinding against each other whenever your knee moves, and it absorbs the shock or stress that impacts your knee every time you walk, run, jog, kneel, squat, climb stairs, or even stand. When you walk, for example, your knee is exposed to about three times your body weight, while running places ten times your body weight onto your knee joint. We get one pair, which come in for a huge amount of abuse during sporting and work activities. The joint is a very complex one allowing an enormous amount of flexibility and transfer of huge forces that allow us to run, jump, kick etc. Amazingly, knees can also be surgically repaired (if you’re lucky) when too much abuse occurs, cartilage damage, tendon repairs and even from extended periods of kneeling (normal working). Injuries are costly and HURT! Prolonged kneeling, particularly on hard-surfaces can lead to a chronic condition called Prepatellar Bursitis, sometimes known as Housemaids Knee. The condition occurs for several reasons, but particularly in tradespeople it is because of the repetitive compression of the Prepatellar Bursa when kneeling. The Bursa is a fluid filled cushion in front of the ‘knee-cap’ which can react to prolonged and repeated damage, becoming swollen and painful. This will inevitably involve increasing discomfort, possibly excruciating pain before requiring total rest, draining the fluid or possibly even surgical intervention. Whilst waiting for treatment, it is likely that you’ll have to find someone else to do the ‘kneely’ bit of your jobs as you won’t be able to face them. Adequate knee protection is now freely available, so why would anyone risk the condition occurring? There is a wide range of prices for kneepads, and everyone knows that there is a huge range of quality as well. But should the decision of what to buy, be made on price? Well, of course not. For a start, buying cheap, whatever the product, is usually a false economy. Buying the most expensive can also be a waste of money, it’s a bit like buying a professional camera if all you need is something to snap memories of the wonderful moments as they happen. However, some kneepads are not even worth considering. Firstly, knee-protection is now classified under CE EN-14404 which sets out the necessary minimum levels of protection against shock absorption. Force dissipation and penetration. So if the knee-pad isn’t even CE marked, it’s been designed to be cheap for the maker to maximise profit and it isn’t going to be worth having. Then, as everything seems to be in life, we move in to the realms of compromises. Foam kneepads are available in various grades that give varying levels of support. 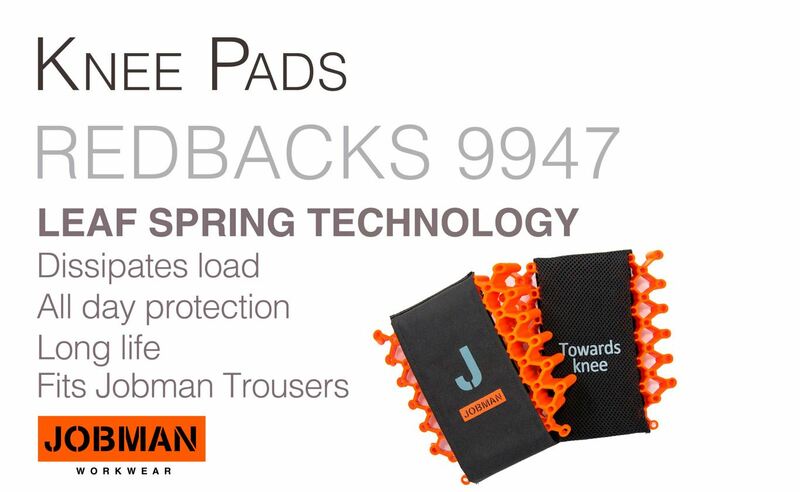 The Jobman Workwear range, for instance, has three pads in its current range. The entry level pad is super-lightweight and designed for kneeling for durations of 1-2 hours per day. The next one up uses denser foam which is recommended for 3-5 hours and there is also a ‘memory-foam’ pad which is aimed at floor-layers and other trades who spend all day on their knees. The compromise is that, as the pads become thicker and less flexible, you notice them much more when you move around or drive with them. Jobman 9947 made by Redbacks, which are a completely different technology offer the ultimate in protection for your knees. They incorporate a ‘leaf-spring’ which flexes as force is exerted down on the enclosing rubber-matrix. This engineered solution maximises the distribution of force over a large area and reduces the ‘point-forces’ on your knees. Yes, these pads are slightly heavier, but if you are constantly kneeling, this is probably a compromise worth taking. Kneepads are consumables - your knees aren't! 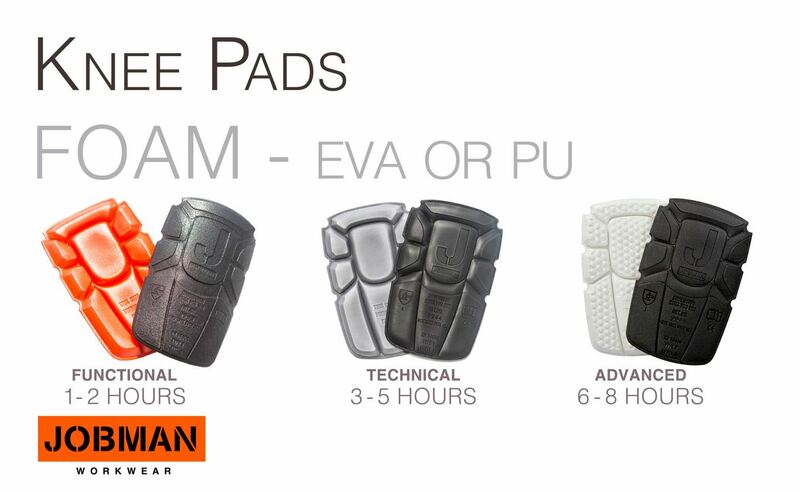 Please also replace your foam kneepads regularly – they are a consumable and do flatten over a period of time. This is usually a factor of use, not poor manufacture or design. If you feel that you are not getting good value for money from the pads, it is probably because you should be using a denser foam pad – or you need to add the cost of a new pair of pads onto the occasional job. But why not have the best of both worlds? Have a pair of foam kneepads for normal days and a pair of Redbacks in the van for those days that you rarely come up for air. That sounds expensive! Yes, in comparison to a rolled up bit of carpet off-cut, it is. But we now have kneepads that are DESIGNED to stop damage to your knees and by using the correct pads you will not only be maximising the value for your money but also investing in your ability to continue working, or being able to walk after you’ve finished. Lastly - a bit more on comfort. Pads should be very comfortable, but they will only be so if fitted correctly in a correctly designed pair of trousers that are the correct size for you. Far too many tradespeople are fobbed off with trousers that are the wrong length, because regular fit is either too long or too short in the leg. Short leg is by far the most common fitting in the UK, which is why there are so many people who wonder why they have shin pads rather than kneepads. If the pad is vertically in the wrong position, even when you pull the trousers up to position the pad correctly, the moment you move, the pad will move horizontally into the wrong position. This is generally because the trouser is the wrong size for you, although sometimes it’s just because there are some shockingly badly made trousers on the market at the moment. As a rule of thumb, the top of the knee-pad should be just level with the top of your knee-cap when you are standing. This will put the pad in the correct position as your trouser will ‘ride-up’ slightly when you kneel down. Please ask your merchant to provide you with trousers that fit. If you try on the trousers and they are too long or too short – don’t buy them, get the right leg length.